lake provides stunning views as well as many recreational opportunities such as hiking, canoeing, kayaking, boating and more. (16 km) west of Waterton Townsite, and is 5,400 feet (1,646 meters) in elevation. This pristine sub-alpine lake is named after a British Royal Artillery Captain by the name of Donald Roderick Cameron, who lived from 1834 to 1921. 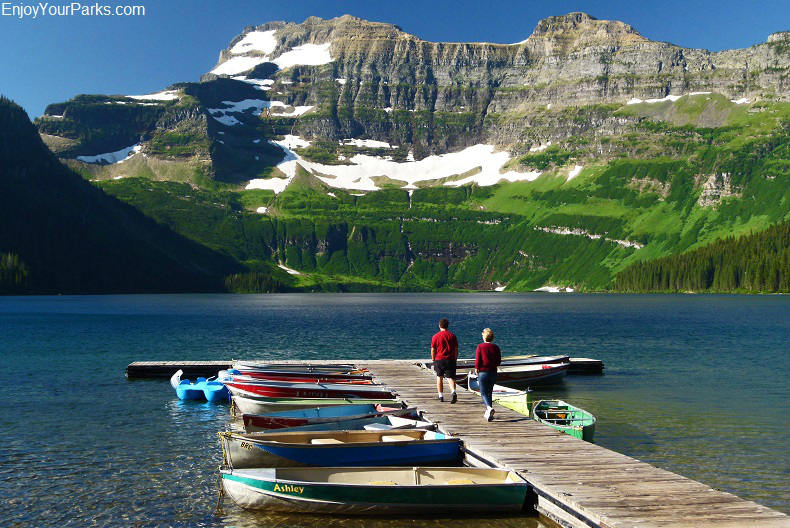 The large mountain that dominates the skyline just to the south of Cameron Lake is Mount Custer of Glacier National Park, Montana. 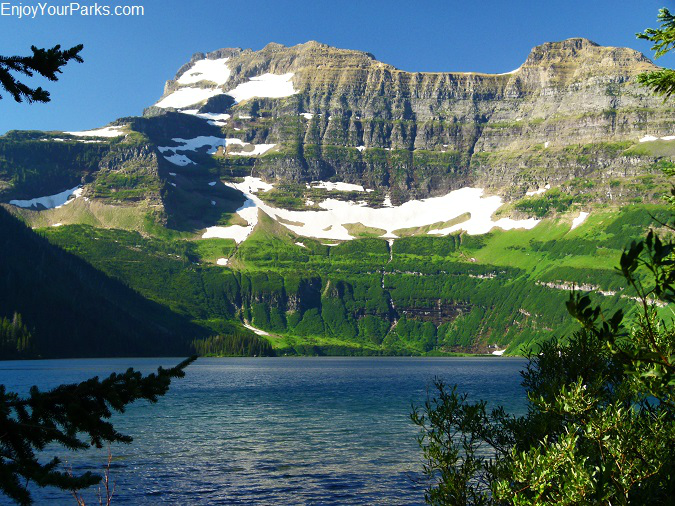 In fact, the southern end of Cameron Lake is actually in Glacier National, Montana. The elevation of Mount Custer is 8,881 feet (2,707 meters) above sea level, and creates a stunning backdrop to an already gorgeous aquamarine-colored lake. 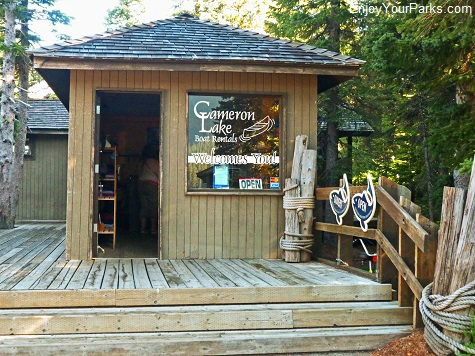 A rental shop is available at Cameron Lake for boats, canoes and kayaks. So if you like to enjoy the water on a pristine mountain lake without actually jumping in the water, there are plenty of options provided at the boat rental shop to help you with that. There is also a souvenir shop and concession area for your convenience, as well as an interpretive center and washrooms. A large parking area makes it easy for even larger RVs to be able to find a nice parking space. There is also a very nice picnic area for Cameron Lake visitors to enjoy. 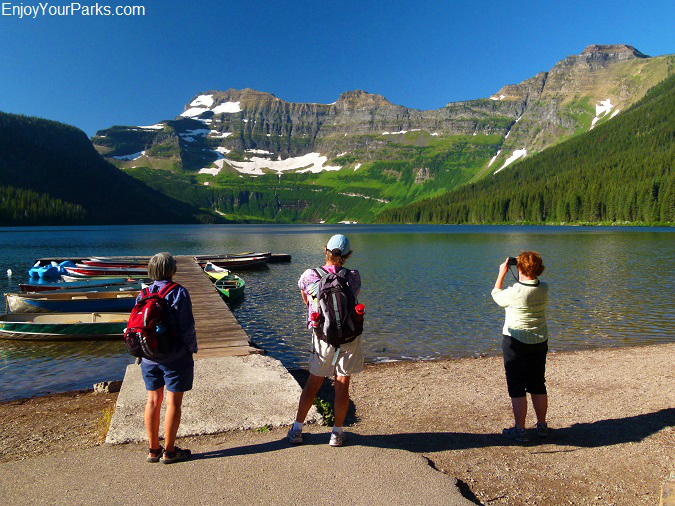 Aside from all this, there is also a great pebbled beach to walk along the shore of Cameron Lake in Waterton Lakes National Park. This beach is also a wonderful place to enjoy a nice picnic while taking in the incredible beauty of your surroundings. 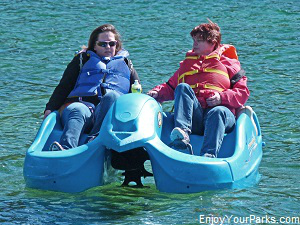 Cameron Lake is really a great place to relax and enjoy Mother Nature at her finest! For boat rental and canoe rental prices and hours, please Click Here. 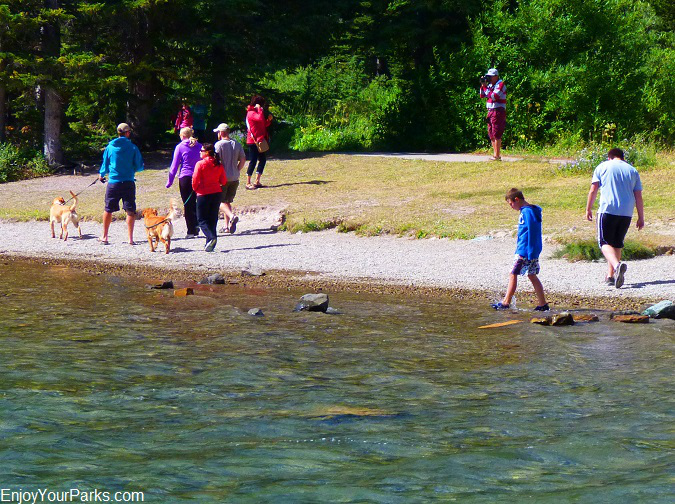 There are plenty of options for you to enjoy the water on Cameron Lake in Waterton Lakes National Park. 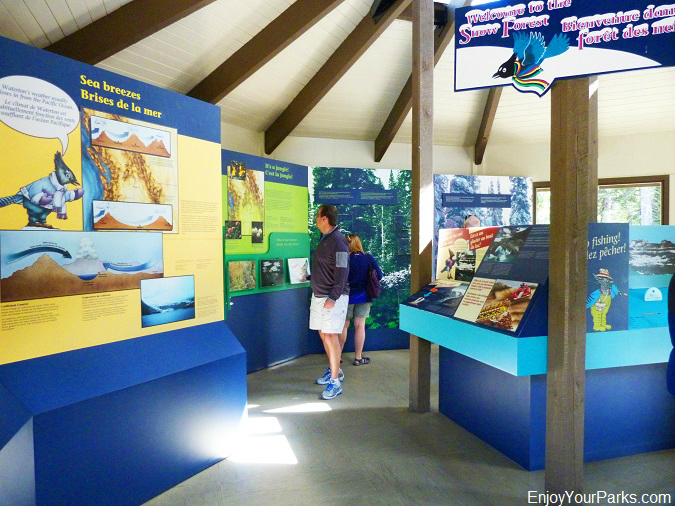 The Interpretive Center at Cameron Lake in Waterton Lakes National Park is very interesting and very well done, so we highly recommend that you take the time to experience what it has to offer. Cameron Lake has a wonderful lakeshore with a very nice beach for you to enjoy while vacationing in Waterton Lakes National Park. 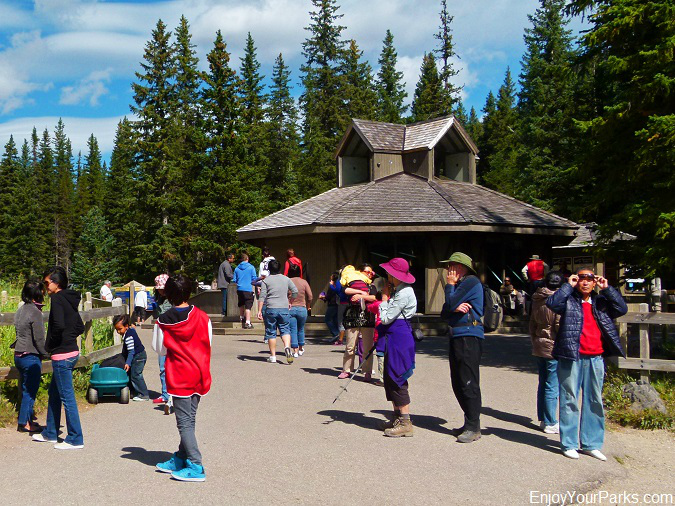 Cameron Lake has a concession area, interpretive center, boat rentals, washrooms and a souvenir shop. Cameron Lake in Waterton Lakes National Park with Mount Custer looming over it to the south. There are several hikes you can enjoy at Cameron Lake, such as the Cameron Lakeshore Trail, Akamina Lake Trail, and the ever-popular Carthew-Alderson Trail. 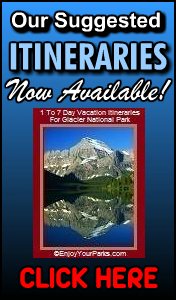 Below are brief descriptions of these enjoyable Waterton Lakes National Park hikes. The Cameron Lakeshore Trail takes you along the west shore of Cameron Lake, where you will hike through a very nice spruce and fir sub-alpine forest. Near the end of the trail, avalanches have cleared the way for an amazing view of Mount Custer, which looms above Cameron Lake to the south. The Akamina Lake Trail is a short hike to a sub-alpine lake. Akamina Lake is not the most beautiful lake in Waterton Lakes National Park, but is still quite nice and only takes about 10 minutes to get there. The Carthew-Alderson Trail is one of the most popular day hikes in Waterton Lakes National Park, and one that we highly recommend. We've devoted an entire page to this 11.8 mile (19.0 km) hike. 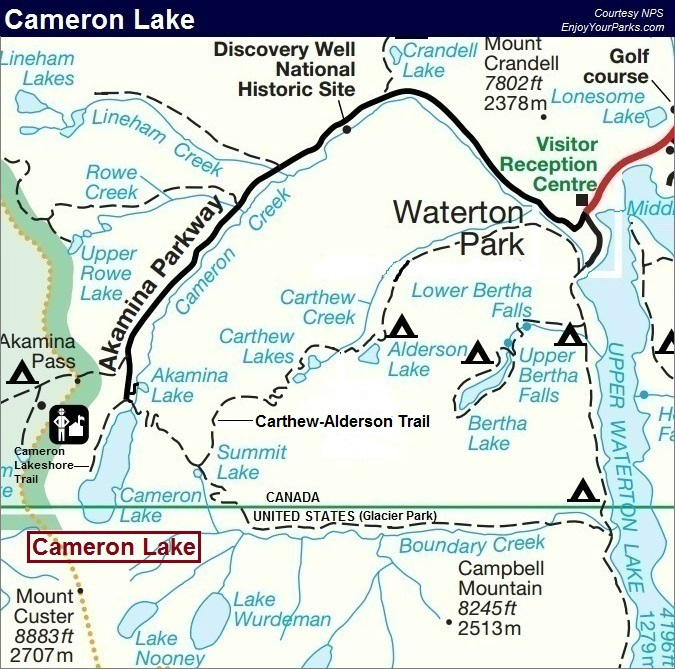 The Carthew-Alderson Trail begins at Cameron Lake and ends at Waterton Townsite. Located at the end of the Akamina Parkway, Cameron Lake is one of the most popular destinations in Waterton Lakes National Park. 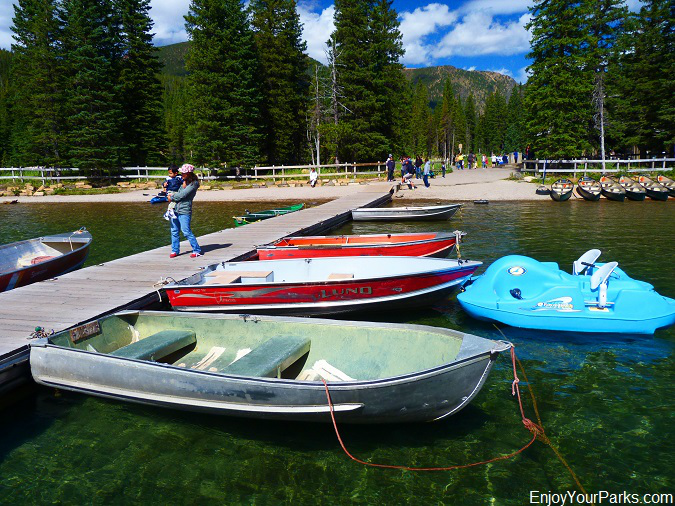 Not only can you enjoy a pristine sub-alpine lake with gorgeous mountains all around it, but you can actually enjoy the water by renting a boat, kayak or canoe. Also, Cameron Lake marks the trailhead to several nice hikes, including the ever-popular Carthew-Alderson Trail hike, which is among the best hikes in Waterton Lakes National Park. Cameron Lake with Mount Custer in Waterton Lakes National Park.